When we polled some of our guitarist friends on what the guitar means to them, and how playing guitar makes them feel, we expected to find a common theme or two, but we didn’t expect the same words to keep surfacing in the majority of answers we received. ‘Therapeutic’, ‘happy’, ‘creative’, ‘calm’... These words came up time and again. We see playing guitar as a form of mindful escapism, a way to create space between an individual and their busy mind. 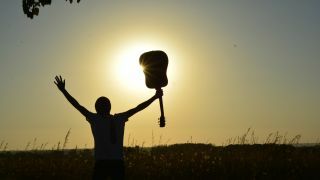 Guitar-playing is beneficial to your overall well-being and mental health in other ways, too, including helping you develop a greater sense of personal achievement. The benefits of music therapy are becoming ever more apparent, with schools, charities and health organisations using playing the guitar to manage a person’s stress, enhance their memory, improve their communication and motor skills, and to help them feel more able to cope with life. Music therapy is widely implemented in general health care in the Netherlands, so it’s unsurprising that a group of researchers from the country set out to explore the link between music practice and blood pressure. They studied three guitarists and found that each patient who practiced for over 100 minutes a day showed a significant drop in blood pressure and a lower heart rate compared to those who didn’t. Whether it’s writing original material or reworking a song for your covers band, the guitar is unlike any other instrument for unleashing your creativity. Ok fine, we’ll throw piano in there too. If you need to get creative for other areas of your life, such as writing an essay for school or pulling together some ideas for your boss, picking up the guitar and noodling around for a few minutes can create space in your brain for an inspired idea to drop in. We are all innately creative, even if at times we don’t feel it. Playing guitar reconnects us with our creativity. That in turn helps us express our true authenticity, and when we do that we’re in the Flow. Named by Mihály Csíkszentmihályi, Flow (psychology), also known as ‘being in the zone’, refers to those times when you’re fully immersed in and enjoying the job at hand. Playing the guitar can help you get epic Flow, so use it the next time you hit a creative brick wall.